Cardinal Joseph W. Tobin, C.Ss.R., was named by Pope Francis to the College of Cardinals on Oct. 9, 2016, while serving as archbishop of Indianapolis. On the eve of that announcement, he participated in a panel discussion alongside Bishop Charles Thompson of Evansville at the Women of the Church Catholic leadership conference in Ferdinand, Ind. I moderated their conversation. 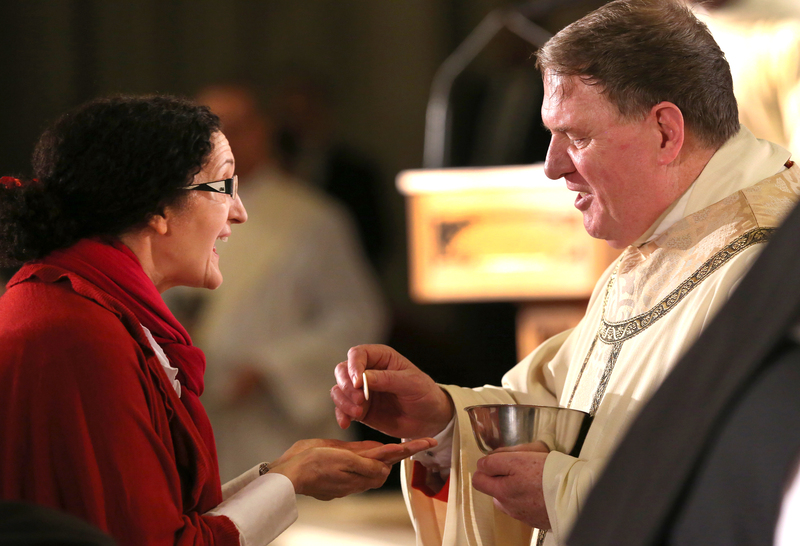 On Jan. 6, 2017, Cardinal Tobin was installed as archbishop of Newark, and Bishop Thompson later was named as his successor in the archdiocese of Indianapolis. Cardinal Tobin and I met again in August 2017 to renew our conversation about women in the Catholic Church. The interview has been edited and condensed for length and clarity. Baker: Pope Francis has captured the attention of many people with his call for a more incisive female presence in the church. What do you think he has in mind? Tobin: I would think he’s talking at a couple levels, because Francis believes in a sense of collegiality and subsidiarity. He has good respect for the local churches but even more for the network of local churches. I think he’s not simply thinking of the leadership at the level of the universal church, but he’s also speaking to his brother bishops. He’s saying you have to ensure that the gifts of women are reflected in the local church that has been entrusted to you. Pope Francis is saying you have to ensure that the gifts of women are reflected in the local church. Every bishop, before he is ordained, has to go through some formularies in which he makes the profession of faith and declares himself in union with the church’s teaching but also recognizing his own responsibility to discern the gifts that are given to the local church and to coordinate them. I think that it’s also at that level that the Holy Father is hoping for a new vision and a new horizon. People seem to be hearing what Pope Francis is saying in a fresh and new way. Do you have any thoughts about what makes it fresh? Because he’s not the first to talk about the gifts of women. Let me give you an analogy. Like the popes before him, he carries the title servus servorum Dei, “the servant of the servants of God.” He’s living that in a very visible way, through simplicity of life, through his spurning of any pomp and circumstance, by his preferential choice for people who normally wouldn’t have access to the pope. Women are living in a new historical era. How will the church respond? My hope is that he’s not just going to be content with a sort of ideology, because, as he says in “The Joy of the Gospel,” the reality is much more important than ideas. If I were speaking to him in American English, I would say ‘Eventually you have to hike the ball.’ You have to connect some concrete choices with what you’re talking about. What are examples of the concrete choices, the concrete actions, that he’s done to show this is not an ideology but a reality? I think that one would be certainly the study commission that he’s named to look at the question of women in the diaconate. For me, what was significant was not simply that he named this commission but who he put on it. Here from North America, we’re delighted that Phyllis Zagano, who is a very erudite woman and also a very clearly spoken woman on the issue, was named to it. As soon as I heard that, I said, “This is going to be credible.” I think that the others that are on the commission, although I don’t know them as well, will give it a greater credibility, also. What he does with this is going to be interesting, but I think that was a hopeful sign. You have to connect some concrete choices with what you’re talking about. There’s a woman who is now the rector of one of the pontifical universities of Rome [Sr. Mary Melone, S.F.A., of the Pontifical University Antonianum], which is another indication that in the area of academia women already play a role, even in the ecclesiastical culture. These are the doors that are opening. I think those would be a couple of examples. What are some examples of collaboration that you have had with women? A study was done by CARA, the Center for Applied Research in the Apostolate, on the role of women in diocesan leadership. One of the assumptions of the study was if you take orders off the table, what are the most significant or incisive positions for women at the diocesan level? They named three: the chancellor, the superintendent of schools and the chief financial officer. In Indianapolis, no credit to me but to my good predecessor, two out of the three were women. I always used to kid the C.F.O., who was a man. I said, “You know, we could go three for three!” The chancellor and the superintendent of schools certainly brought to that level gifts and insights without which we would have been impoverished otherwise. I can’t imagine a diocese that would want to minister in the fullness of the church’s mission without having the voice of women. That convinces me of something that Benedict XVI used to say frequently about religious life. He’d say a diocese or particular church that does not have religious is impoverished. It doesn’t mean that it can’t function, but it functions with one or both arms tied behind its back. Now, of course, you could say that even with that example he’s talking about women, because women are 80 percent of religious life. I think that analogously, I can’t imagine a diocese that would want to minister in the fullness of the church’s mission without having the voice of women represented in its decisions. In the Archdiocese of Indianapolis, I think particularly of Annette “Mickey” Lentz, who is the chancellor. She is serving in a number of places we wouldn’t normally expect to see a laywoman. She was present and participative in the priests’ council, in the college of deans and at all levels of the archdiocesan leadership. She is the face of the archdiocese. What motivates you to promote and encourage women in leadership, whether on the local level or on the level of the universal church? I think some of the most deeply held values are values that we experienced as children. Growing up in a family that had a lot of women—a mother, her two sisters who lived with us and eight sisters of my own—and to see all of them encouraged and confident in themselves, with a very strong and noncoerced connection with their faith, encouraged me. In fact, people would thank me or challenge me for stances that I’ve taken in the past. I would explain, this is something I don’t have to think a whole lot about. What has struck me in the years that followed, especially years in ministry, is being more and more aware of how women have been given a lot of reason to abandon the church—the sort of disrespect, and even more than disrespect. If you look at the Gospels, Jesus doesn’t really get on people for overtly oppressing the poor. What he does get on them for is not seeing them. And I think it’s true with women, who often, in particular outside of North America, form the real poor. The first sin is to not see them and to go on your merry way. Or if you see them, to cross to the other side of the road. The guidelines for seminary formation that were released in December 2016 from the Vatican [the “Ratio Fundamentalis Institutionis Sacerdotalis”], speak of the “formative significance” of the presence of women in seminary formation. You will be heading up the process of implementing these new guidelines here in the United States [as the chair of the U.S. Conference of Catholic Bishops’ Committee on Clergy, Consecrated Life and Vocations]. When you think about seminary formation, particularly about forming seminarians to have healthy and collaborative relationships with women, what would you hope to see in the next 10 years? Well, first there’s the overarching challenge of clericalism, which is not simply a potentially misogynistic mindset, but it’s a closed mindset. It’s a closed mindset that believes in certain privilege and entitlement. Francis has challenged that. I think that one important thing is not simply exposure to women in healthy relationships but relationships that at times make a cleric responsible to a woman. Now I found that very interesting in Indianapolis because there are women in the Catholic Center who supervise clerics, priests and even monsignors. I think the ability to relate in that manner to a woman is also important. In my own formation, before ordination and when newly ordained, I had women supervisors, as a catechist and then as a community organizer, and it was a good thing. You noted that sometimes women leave the church because they feel that they’re not seen or that there’s not a place for their gifts. Recent studies have shown that among millennials, for the first time in the United States more Catholic young women are moving away from the Catholic faith than Catholic young men. What would you say to a young woman who’s considering leaving the Catholic Church? I hear this pronouncement with kind of a sad frequency. I always ask, “What do you think you’re leaving?” At least in my belief, it’s not the Elks or the good old boys club. This is the body of Christ, and this is where his word is proclaimed and the sacraments are celebrated. I wouldn’t let anybody drive me out of that. In saying this, I don’t want to minimize the sort of estrangement that I think younger women feel. I think that bishops have to be very concerned about this, because of the incredible implications of that. I had a very good friend, a writer in England, who was a professed atheist. He said one of his big obstacles was that both of his parents were atheists, but his mother was more convinced. He said that’s harder for me to get over, because, I think, that of all of the nurturing he received from his mom, he also received that. That’s who we could be looking at on a massive scale if young women no longer feel a connection to the church as sacrament of salvation. That’s really serious. I think one way we could respond is for women who stay in the church to be open and eloquent as to why. To say, despite the disappointments and the suffering, this is why I’m there. As you look to the future, what would be your hopes for women in the church? First, my hope would be that they embrace it as their home. I remember back in 2010 I promised to lead a retreat for our Irish brothers in Ireland. There was a lot of turmoil there, and still is, in the Irish church. There was a lot of anger towards the institutional church. I said: But, where do you hear the word of God; where do you celebrate the Eucharist? What church is that? That’s the home. That’s it, you know. My favorite definition of heresy is an unwillingness to deal with complexity. It’s a desire to simplify into one bite-sized morsel. My hope is that the complexity of the mystery of the church is always revered. And that people don’t lose faith in the power of Christ, present in his church. Then you settle for something that’s less. I hope that women will continue to speak the truth and speak the truth to power when they need to. And most of all that they don’t lose a sense of joy. Not to lose the joy that we have because of God’s incredible love. The gifts of women :( If the church treated women as equals with men, this kind of complementarianism wouldn't exist in the church. Pope Francis has said women can *never* be priests and it seems he's not even going to let them be deacons, so let's not pretend the pope is a friend to women or that any progress on this issue has been made since he's been pope. Saying that Christ only chose men as his 12 apostles then makes the point that all clerics, including the Pope, must be ethnic Jews. All the Apostles were Jewish men. The false logic that constrains women is painful. And, what about men who choose to be married, Roman Catholic, husbands and priests....like their converted-married-formerly-Episcopalian-priest colleagues? Gifts? Discernment? Euphemisms galore to mask demands for self-worshiping prerogatives of defining religion as a selfish experience. A pope of process theology, who treats God as confused and who has no place for Catholics who treat truth as immutable might be receptive to such evil, but God is not amused. God is not confused - but apparently the male, celibate clergy chooses to negatively stigmatize any discussion of women in ministry as “self-worshipping.” Despite single papal announcements to the contrary, the call to women to minister I our church as deacons or priests is not “receptive to ....evil”. No euphemisms in this article! Obviously God is not confused, which is why it is stupid for Pope Francis to insist that he is through process theology. Self worship does involve believing that truth changes over time, that it reflects something other than the unchanging mind of God. Got it? God is not confused - but apparently the male, celibate clergy chooses to negatively stigmatize any discussion of women in ministry as “self-worshipping.” Despite single papal announcements to the contrary, the call to women to minister in our church as deacons or priests is not “receptive to ....evil”. No euphemisms in this article! You want an answer as to why young women are leaving the Catholic church? Look no further than James' response. We young women are not dumb enough to believe that people like this represent Jesus' loving teachings and we want no part of this false "Body of Christ," formed by people who hold these beliefs, that closes off any kind of conversation among people currently under-represented in the Catholic hierarchy. Yes, there are good eggs and I've been lucky enough to find them and to engage in a loving and open Catholic community. But the unfortunate reality is there are a lot of people that think like James' response, and we young women aren't buying it. So in order to be "loving" it would require that women are incapable of the sin of pride? James......and I say this without malice....you don't make a bit of sense. I am following the logic of the thread. The suppositions preceding and following my other comments that it is “unloving” to accept anything but the predetermined conclusions of what is often claimed as a process of “diologue.” But the fact is all of God’s children are sinners. We all commit sins of pride, especially prone are those speaking in a revolutionary frame of mind who insist they speak for everyone within a particular group whose “rights” they claim to advocate. Women who don’t agree with what self-appointed spokespeople for women advocate have rights too. Women who write books against women’s ordination and who affirm what is a part of the permanent deposit of the Catholic faith have gifts too that should not be ignored and insulted by smugly prideful Cardinals whose demonstrated knowledge of the Catholic religion is unworthy of their office. Additionally, my comments on process theology confuse some people. I didn't invent that stupidity. Prominent theologians did. It originated in the sixties and seventies. Smart aleck theologians like Kasper and Kung advanced the idea, recently revived by Pope Francis, that God is in the process of learning how to be God and learning from his creation. It's their stupidity, not mine. The sin of pride knows no limits! One more point. Dorothy Day said, "Anyone who doesn't recognize a feminist's capacity for malice and deception has no real respect for women because they see them as predetermined and not as a divinely endowed free creature with a human capacity for good or ill and truth or falsehood." “incisive” df. penetrating; cutting; sharp. HMMM, Maybe you all could instigate another Reformation. That would please the Lord endlessly now, wouldn't it? Not nearly as much as entire dismantling of catholic heresy and tradition would. When it comes to women, Joe Tobin knows whereof he speaks -- 8 sisters and 4 brothers -- 1 bathroom. He repeats the story on every occasion. Bravo! The Catholic priesthood, Ms. Cox, is neither a prize to be won, a right to be granted, a title to be conveyed, or a glass ceiling to be shattered. It is a holy institution, not unlike Holy Matrimony, where a man voluntarily sacrifices his love for a woman who might have become his wife and his desire for biological children in favor of accepting a calling from Our Lord to become pastor and provider to Christ’s Church. Efforts to characterize Christ’s Church as something akin to a business enterprise for which women seek equal opportunity in its leadership is a gross perversion of the truth of the Catholic Church which is the mystical body of Christ and His bride. Mary Magdalene was a woman for whom Christ showed love and respect but she was not His disciple nor did He call her to be a disciple. She is not, nor can she ever be, a prototype for the male priesthood precisely because her nature is female and oriented toward motherhood. A woman's nature is not interchangeable with a man’s. We are different...equal in value before God, loved by Him, different in our human nature and complementary in our human bodies. Jesus Christ is male; the Father/Creator is male; the Holy Spirit is male. We need merely contemplate the words Christ provided us when He taught us to pray in the "Pater" Noster. Hence, he who is Alter Christus, as priest, must be male. As Christ is head and provider to the Church...so too is a priest who assumes and undertakes Christ’s role in this earthly realm...a male husband to a female bride, the Catholic Church. Humility is a virtue that one hopes ambitious men and women who view the Church and the priesthood as institutions in need of transformation and conquest, in the name of Progress, might seek to develop. I am absolutely dumbfounded by your vitrious response! Your insult that I would participate in a "gross perversion of the Catholic Church" is beyond my comprehension! You judged me as lacking humility. Then, you accused me of being too prideful. Good heavens! The reactionary foul responses posted are certainly not in keeping with Christ's messages of love and forgiveness. I had thought that this venue was a safe place to have a realistic, honest, open dialogue about women in the Church. I did not expect to read what I would consider character assassinations. There is only One Judge in my life - God, the Father. Comments invite responses; particularly when they are published in a Catholic magazine in a public forum and they challenge the traditions of the Catholic priesthood from a purportedly Catholic woman’s perspective. You simply do not speak for all Catholic women and you certainly do not speak for me. I expressed my opposition to your position seeking reform of the priesthood to include women in a civil and straightforward manner by reference to the millennia old foundational teachings of the Catholic Church. No part of my response constituted an ad hominem attack on your person. If my disagreement with your position caused you to feel judged, attacked, maligned, dumbfounded, insulted, and/or unsafe thus requiring a safe space in which to recover, I suggest you take repose for as long as you require it, and then reply to my comment employing arguments grounded in faith and reason. I look forward to continuing this exchange at your convenience. I know too many Chardonnay-swilling feminist subversives. Women do not belong in the priesthood. Jesus made it that way. Feminist hubris is divisive and bad for Catholics’ morale. Enough already. Look at the Church of Sweden for what is the evil anti-incarnation anti-Jesus goal of feminists. "Chardonnay-swilling feminist subversives. Women do not belong in the priesthood. Jesus made it that way." Astounding! "Feminist hubris." Good grief! How is it that you did not address Pope Francis referring to Mary Magdalene as "the Apostle to the Apostles". Even Jesus referred to Mary Magdalene in this manner. SHE is the one whom Jesus chose to deliver his message to his other followers upon his Resurrection. Mary Magdalene was at the scourge of Jesus, at his crucifixion and at his resurrection. Perhaps, you doth protest too much! There is so little room for discussion when it comes to women seeking positions on an equal-footing with men in the church. I am not full of hubris. I do not swill Chardonnay. I am not subversive. If the morale of Catholics is so delicate, then perhaps there is more remiss here than women speaking their mind! God bless you. Keep in mind that Jesus didn’t ordain anyone. Read the entire New Testament and you won’t find any celebration of Eucharist except one reference in a Pauline letter to the Corinthians. The New Testament has references to house churches with local leaders including women. The first description of a Christian Sunday liturgy is from Justin Martyr around 150 C.E where the leader is referred to as President. There are no priests in the New Testament except for the one High Priest, Jesus Christ, referenced in the Letter to the Hebrews. The CARA study mentioned had as one of its assumptions that you "take orders off the table." That is understandable given the taboo of discussing the ordination of women to the priesthood and the glacial speed of the discussions about ordaining women to the diaconate, but taking orders off the table leaves almost nothing of import left to discuss. The essential work of the church is prayer, liturgy and dialogue about God. Dialogue about God includes church doctrine and public discussion of matters related to the church. By and large, no one really cares who the CFO of the diocese is and the role of chancellor is not familiar to most. Superintendent of schools is not critical to the primary reasons a person goes to church. A person could go to church for years without hearing about or seeing the CFO, the chancellor, or the superintendent of schools. For women to feel that they are heard in the Catholic Church, they need to be able to speak at Mass. They need to have some input on church doctrine. And they need to have some kind of public dialogue with the bishops. The current state of affairs in the Church gives the message that women are supposed to shut up, serve coffee, and be generous in writing checks. If Cardinal Tobin is curious as to why I stay in church despite its "disappointments and suffering", my answer would be that I have found a life-altering conversation in church and an excellent homilist. I have mostly given up on the diocese and the larger church because neither offers much of interest to me and they usually fail to speak the truth. I have paid a high enough personal price for being in church that I would never invite someone to become Catholic because the church really is not safe for any woman who claims the rights of an adult. By "rights of an adult" I mean the right to hold your own opinion and to express it, and the right to question those who would issue orders as though speaking to a child. Of course, as long as we continue our 'Clerical' system we will have 'clericalism'. Necessity is leading us in the right direction. We do have 'lay' chancellors, lay communion ministers, lay 'parochial administrators' -- and more and more. We need to keep going in that direction going until we have 'lay' preachers, 'lay' presiders at the Eucharist. and Bishops willing to 'ordain' laity to carry out specific functions of 'extending their presence' to provide the sacraments. It might be a temporary position - power and designation to function in a particular capacity for as long as the Bishop wishes, and for as long as the person is capable and willing. Perhaps the 'Clerical system' developed because it served the purposes of the Church of past times. It seems to be a broken system that no longer serves our needs. If Bishops ordained and appointed laity, laity are both men and women. Clericalism has always been broken. No Man (or woman) should ever again be called priest or reverend. Speaking the truth is great, too bad that many are just lying. Projection is painful to observe. The overarching challenge of ridiculous accusations of clericalism is not simply a potentially prideful mindset but a closed mindset. It’s a closed mindset that believes in a certain privilege and entitlement to abandon humility and feel superior to magisterial authority, to never question whether alienated women, and the clerics who defend them, who chastise the Church might be suffering from sins of pride, not based in honesty but in smug, phony, hypercritical, self-worshiping dishonesty. I don't understand the logic that draws a line between pride and the desire to be equal in the eyes of humanity. Was it prideful for women to desire the right to vote in the United States? The desire of women to be involved in the conversation and growth of the church is not prideful; at least for me it is the encouragement of the Spirit, to desire a church that reflects God's original design of this earth. Man and woman God created them. Not man more than or over woman. To me, anything less than man and woman in equal contribution to the church falls sort of God's beautiful creation of and plan for us. I seek no authority. And I am certainly not wonderful or loving enough to be worshipped, by myself or others (trust me, ask my friends how self-deprecating I am). I know, in my head and in my heart, I hold no candle to the awesome LOVE of God. But women are as much a part of creation as men, and if there is a lesser voice for them, or if those who have had no female experience think they can speak to the experiences of women, how can the church be expected to love women as God intended? How can it be expected to meet women's needs when no one in the position to meet them has experienced what it is to be a woman. We're not prideful. We just want an equal opportunity to love and be loved, through God's grace and mercy. This article also appeared in print, under the headline "‘I hope women will continue to speak the truth’: A conversation with Cardinal Tobin," in the January 22, 2018 issue. Kimberly F. Baker is an associate professor of church history at Saint Meinrad Seminary and School of Theology in St. Meinrad, Ind. She was co-chair of the inaugural Women of the Church conference, held October 7-9, 2016, in Ferdinand, Ind. (womenofthechurch.org).